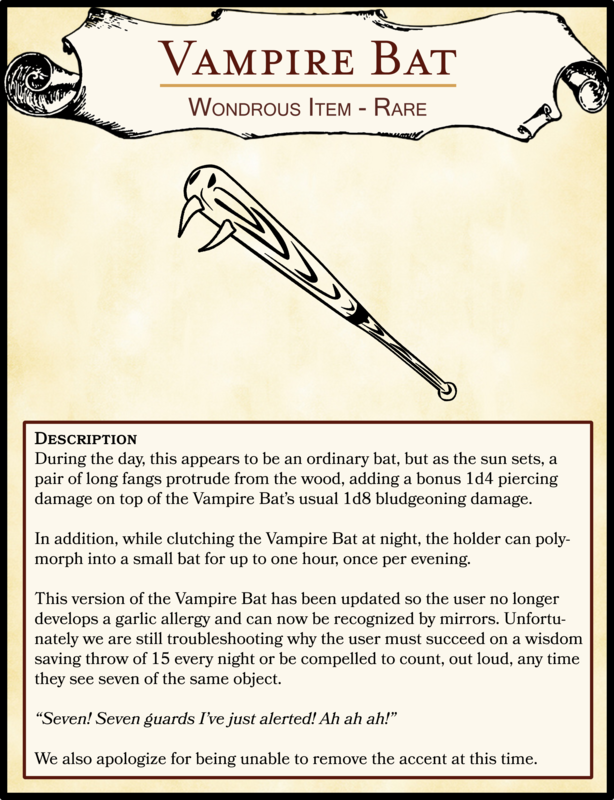 During the day, this appears to be an ordinary bat, but as the sun sets, a pair of long fangs protrude from the wood, adding a bonus 1d4 piercing damage on top of the Vampire Bat’s usual 1d8 bludgeoning damage. In addition, while clutching the Vampire Bat at night, the holder can polymorph into a small bat for up to one hour, once per evening. This version of the Vampire Bat has been updated so the user no longer develops a garlic allergy and can now be recognized by mirrors. Unfortunately we are still troubleshooting why the user must succeed on a wisdom saving throw of 15 every night or be compelled to count, out loud, any time they see seven of the same object. We also apologize for being unable to remove the accent at this time.